In this article, the ying qi cycle is used to examine the way in which the paired extraordinary vessels and extraordinary fu may relate to the evolution of consciousness and the art of humanity. This investigation is a coalescence of two previous articles—one which examined the way in which the diurnal unfoldment of the extraordinary vessels (following the ying qi cycle) may have a relation to the evolution of consciousness (CJOM, Fall/Winter 2009), and one which proposed a theoretical model in which the extraordinary vessels and the extraordinary fu are paired together in a one-to-one correspondence, similar to the manner in which the zangfu and primary channels are paired together (Chinese Medicine Times, February 2010). As was posited in ‘Pairing’, the ren, chong, and du mai have intimate correspondences with the three dantian and the three treasures of jing, qi, and shen. In this schema, the ren mai corresponds to the jing/essence, lower dantian/Earth, and the Uterus, while the du mai corresponds to shen/spirit, upper dantian/Heaven, and the Brain. The chong mai, being the polarity between ren and du, yin and yang, has correspondences to qi and blood, middle dantian/Humanity, and the Vessels/mai. 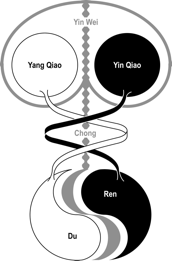 Thus, by extension of looking at this trinity in relation to the three treasures, the ren mai may even be called the Sea of Jing, the chong mai the Sea of Qi, and the du mai the Sea of Shen, thereby shedding some light on the discussion present in acupuncture and Chinese medicine of both the Brain and the Heart being the ‘residence of the Shen’. The qiao mai and the Marrow can be paired together as both have correspondences to global nourishment by the essence (and particularly nourishment of the Brain), and to movement in general. The wei mai and Bones both relate to protection and boundaries, and are therefore intimately related to connecting the inside and the outside and the process of horizontal integration. Finally, the dai mai and the Gall Bladder both have strong correspondences to the Wood element and share the function of assisting the qi in returning to the Source. This allows post-heaven to nourish and replenish pre-heaven (both of the Kidneys and the quiescent state of the extraordinary vessels—ren-chong-du mai) and corresponds to the process of transcendence—the transition from a state of duality to a state of unity. It becomes easier to see how well these pairings fit together when examining the flow of the ying qi cycle. The ying qi cycle is the process of the dynamic flow of qi at the level of humanity (vertical and horizontal integration), expansion outward from the Source and the return to Source on a daily basis. The entire flow of the primary acupuncture channel system (through which the ying qi cycles on a daily basis) is based upon connecting above and below and the interior and exterior. As stated by Yuen (2006, p104), the primary channels “…are developing and devising a connection between External and Internal…constant movement between the outside and the inside, Exterior and Interior connection.” Similarly, the very anatomy of the primary acupuncture channel system is based on connecting above and below—the yang primary channels flow from the fingertips down to the toes, bringing yang qi from Heaven down to Earth, and vice versa for the yin primary channels, bringing yin qi from Earth up to Heaven. The ying qi cycle thus provides an elegant means to examine the associations of the extraordinary vessels and fu and their relation to vertical and horizontal integration, center and periphery, and the evolution of consciousness. In ‘Evolutionary Unfoldment,’ the diurnal flow of the ying qi through the primary acupuncture channels was used to examine the order in which the confluent points of the eight extraordinary vessels are accessed on a daily basis. To summarize this theoretical acupuncture model, during the first half of the cycle—corresponding to the time period from 3am to 3pm—the ying qi starts in the Lung channel and travels through the Large Intestine, Stomach, Spleen, Heart, and Small Intestine channels. During this journey, the ying qi accesses (in sequential order) Lieque LU-7, Gongsun SP-4, and Houxi SI-3. These three confluent points correspond to the extraordinary vessels that have their origin in the lower dantian—the ren, chong, and du mai, respectively—which may be said to correspond to the quiescent state (the deep, still reservoir of yin and yang from which all life springs forth). These three extraordinary vessels correspond to the oneness as it is just beginning to form the polarity of yin and yang within the body. This is followed by the mobilization of the dynamic yin and yang, which occurs when the qiao mai are accessed at Shenmai UB-62 and Zhaohai K-6. The yang qiao mai may be seen as the movement of yang (“Yang Motility”) that arises from the quiescent yang of the du mai (“Sea of Yang”), while the yin qiao mai may be seen as the movement of yin (“Yin Motility”) that arises from the quiescent yin of the ren mai (“Sea of Yin”). This may further clarify the pairings of the yang qiao with the du mai and the yin qiao with the ren mai within the master-couple system. [ii] Continuing along the ying qi cycle, the dynamic yin and yang of the interior is linked, consolidated, and integrated by the yin wei mai (which occurs as the ying qi reaches Neiguan P-6). The yin wei mai is paired with the chong mai in the master-couple system, suggesting that the yin wei mai has the function of balancing and integrating the dynamic yin and yang of the qiao mai, just as the chong mai balances the quiescent yin and yang of the ren and du mai. After the interior is integrated, one is able to extend and connect within and without as represented by the opening of the yang wei mai, as the ying qi reaches Waiguan SJ-5. The yang wei mai, which “masters the exterior and movement towards the exterior,” may be seen as an expansion outward from self, and is intimately involved in horizontal integration. Finally, the exterior energetic matrix is consolidated, brought together, and regulated by the dai mai (as the ying qi accesses Zulinqi GB-41), which plays an integral role in balancing vertical and horizontal integration through dynamic structural stability and spherical integration. [iii] The dai mai also facilitates the return to the Source, thus taking one from the most exterior back to the deepest interior and allowing one to start the cycle again the next day. In following the unfoldment of the extraordinary vessels (as viewed through the ying qi cycle) we see a clear reflection of the evolution of consciousness through the acupuncture channel system. This is the process of the one breaking into two, into three, into the ten thousand things, allowing integration within oneself and connection to all else present at the level of humanity, and eventually transcending duality and returning to oneness to start the cycle again. In the following sections I will follow the ying qi cycle once again to further build on this theoretical acupuncture model, in the hope that this will allow greater insight into the relation of the paired extraordinary vessels and the extraordinary fu to vertical and horizontal integration and the evolution of consciousness. Starting in the Lung channel, the first confluent point we come to is Lieque LU-7, confluent point of the ren mai. In the model proposed in ‘Pairing,’ the ren mai is paired with the Uterus and jing, both of which correspond to the lower dantian. Thus we start at the quiescent state, the lower dantian, which is the source of the extraordinary vessels and pre-heaven. Within the extraordinary fu, the Uterus also corresponds to the most logical starting point, as it is the seat of the essence. As noted by Jeffrey Yuen (2006, p69), “…if you were to follow a hierarchy of the Curious Organs, we would begin that hierarchy with the Uterus. The Jing Essence begins in the level of the Uterus”. From the Lung channel, the ying qi continues through the Large Intestine and Stomach channels, until it flows into the Spleen channel and reaches Gongsun SP-4, confluent point of the chong mai. At this point, the ying qi accesses the chong mai (within the extraordinary vessels), and therefore the Vessels/mai (within the extraordinary fu) and the middle dantian. Thus we move from the Uterus to the mai, from the lower to the middle dantian. Continuing on, the ying qi flows through the Heart channel and into the Small Intestine channel, until it reaches Houxi SI-3, confluent point of the du mai—which in this model also corresponds to the Brain and the upper dantian. Through these first six channels of the ying qi cycle (LU-SI, 3am-3pm), we can see a clear unfoldment of the extraordinary vessels and fu corresponding to the three dantian and the vertical axis of integration within the body (also referred to as the taiji pole or the zhong mai (Central Meridian))—starting from the lower dantian, Uterus, and jing, moving to the middle dantian, Vessels/mai, and qi, and finally reaching the upper dantian, Brain, and shen (see Table 2 below). This mirrors the process of internal alchemy, transforming jing into qi and qi into shen, and may be said to correspond to the vertical axis of integration and the quiescent state of the ren, chong, and du mai. This is the formation of the core of the body, corresponding primarily to pre-heaven, vertical integration, and the Source. (It is of note that the ren, chong, and du mai (along with the dai mai) are also referred to as the “nuclear” vessels, as compared with the “peripheral” vessels of the qiao and wei mai—we will return to this point later on (Pirog 1996).) This process of vertical integration is also the means of connecting Heaven and Earth within oneself, thus allowing the spirit/awareness/consciousness to be firmly rooted in the essence/body. As was seen in ‘Evolutionary Unfoldment’, it is from this quiescent state of pre-heaven and vertical integration that manifestation, integration within self, and connection to everything else present at the level of humanity can occur, as represented by the activation of the qiao and wei mai. Thus the qiao and wei mai correspond relatively more to the state of post-heaven and horizontal integration within the extraordinary vessels. We can now continue along the ying qi cycle and, in observing the extraordinary fu, we will see this process mirrored once again. This relation between the qiao mai, Marrow, and legs is significant and deserves further discussion. If both the qiao mai and the Marrow are seen as corresponding to the emergence of the post-heaven state from the Source/pre-heaven, then, within the extraordinary vessels and fu, they also correspond relatively more to horizontal integration and the periphery. Within the anatomy of the human body, the legs and arms also correspond more to horizontal integration and the periphery, relative to the trunk/core of the body. The legs allow the human being to move through the world and thus have a greater capacity for experiential awareness at the level of humanity—much as the qiao mai and Marrow relate to the movement of essence through the body, leading to the manifestation and nourishment of the individual human being. Although it is the legs and feet that connect to Earth and allow each individual to move through the world, it is the arms and hands allow each individual to truly connect (‘link’) to everything else present at the level of humanity—as humans we wave to each other, shake and hold hands, hug and embrace, and touch to experience and connect to the world around us. This is also seen in acupuncture and qigong theory and practice—Baihui DU-20 is the point that exchanges qi with Heaven, Yongquan K-1 exchanges qi with Earth, and Laogong P-8, in the center of the palms, exchanges qi with the level of humanity. Similarly, it is the Bones that create channels for the Marrow to flow through, linking the flow of essence throughout the body and providing the structure of connection and integration. The Bones also participate in the entering and exiting of qi, and thus assist in the connection between oneself and everything else present at the level of humanity. Thus the wei mai, Bones, and arms also share correspondences to horizontal integration and the periphery. Here we can see a beautiful resonance—the ren, chong, and du mai (and Uterus, mai, and Brain) correspond to the trinities of the three dantian and the three treasures that form the vertical axis of integration within the body, connecting Heaven and Earth, above and below. They are the three aspects of the taiji, the Supreme Polarity of yin, yang, and the pivot between. Thus they are three yet one. They correspond to the core of the body and the relatively pre-heaven state, and are the “nuclear” extraordinary vessels. It is this axis of vertical integration/pre-heaven that allows one to experience horizontal axis of integration, connecting the inside and the outside, connecting with all else present at the level of humanity. The horizontal axis is in correspondence with post-heaven and also corresponds relatively more to duality and the periphery. 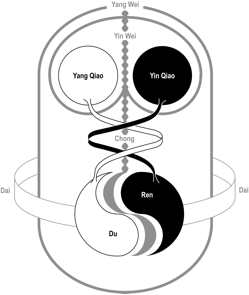 Thus the qiao and wei mai are the “peripheral” extraordinary vessels and are in a state of duality (they have both yin and yang channels), and they correspond relatively more to the four limbs and horizontal integration. Pre-heaven exists in a state of unity, post-heaven exists in a state of duality. Finally, as the ying qi flows into the Gall Bladder channel and reaches Zulinqi GB-41, the dai mai and Gall Bladder are accessed and there is the opportunity for balance between these processes of vertical and horizontal integration, allowing one to transcend duality, reach a state of wholeness, and return to the Source to start a new cycle. The dai mai and Gall Bladder both assist in connecting back to the pre-heaven of the Kidneys and Uterus, as well as the quiescent state of the extraordinary vessels, bringing the post-heaven essence back to nourish pre-heaven and preparing to start the cycle again the next day (Richardson 2010). This corresponds to the movement from the greatest exterior and expanded state back to the deepest interior. As seen in ‘Evolutionary Unfoldment,’ the dai mai may correspond to the movement from the most expanded, external, post-heaven state back to the deepest pre-heaven. This is a return to the quiescent state of the ren–chong–du mai within the extraordinary vessels, which correspond to the lower dantian and the pre-heaven state. [vi] Similarly, in ‘Pairing,’ it was seen that the Gall Bladder, as an extraordinary fu, shares this function of connecting the post-heaven essence of the Spleen to the pre-heaven essence of the Kidneys. The Gall Bladder, which is paired with the Liver within the 12 zangfu, may also be seen as the link between the twelve primary channels and zangfu (post-heaven) and the extraordinary vessels, extraordinary fu, and lower dantian (pre-heaven) (Yuen 2006). Thus the dai mai and Gall Bladder, in part, render the yin and yang aspects of being (Above and Below, Inside and Outside) into a unified whole and allow one to start a new cycle again the next day. This ability/function of both the dai mai and the Gall Bladder to transcend duality and facilitate the return to source on a daily basis is significant. This is a challenging point of transition that occurs not only within the ying qi cycle, but also within the evolution of consciousness as mirrored by the daily unfoldment of the extraordinary vessels and fu. This relates to the drive towards transcendence, moving from the world of duality and post-heaven into a state of unity. From this perspective it is interesting to note that, in Neoclassical Pulse Diagnosis, there is a dominant tendency for individuals to have a dai mai pulse (which occurs when both middle positions are the largest) according to diagnosis of the extraordinary vessels, as well as a tendency for a Wood (GB/LIV) to Metal (LU/LI) blockage along the ying qi cycle (Morris 2009). [vii] These pulse patterns correspond to the end of the ying qi cycle, when one is just on the verge of transitioning back to the interior and pre-heaven state. In modern society, the individual’s energy is often “exteriorized” and drawn outward, and there is difficulty in guiding the qi back to the Source and returning to the quiescent state—thus it makes sense that many individuals would have stagnations along these patterns. Perhaps it is also for this reason that the Gall Bladder is associated with courage—it takes courage to maintain the dynamic tension between vertical and horizontal integration, and to make the transition from the greatest exterior back to the deepest interior, from a state of duality to a state of unity. Further, if the qiao and wei mai are said to correspond to the legs and arms, respectively and relatively, then perhaps the dai mai can be seen to relate to the head. [viii] Just as the legs and arms are in a state of duality (as are the qiao and wei mai), the head is a singular peripheral “limb”. Thus, in the second half of the ying qi cycle, there may be reflected once again the movement from the lower dantian, to the middle dantian, to the upper dantian. The qiao mai and Marrow correspond to the legs (as well as grounding and movement), which can be seen as an extension out from the lower dantian, while the wei mai and Bones have correspondences to the arms (as well as integration and boundaries), which can be seen as an extension out from the middle dantian. The dai mai and Gall Bladder, relating to transcendence and the return to oneness, have correspondences to the head and the upper dantian. The head shares aspects of both core and periphery—thus it is a meeting place of duality and unity, and the place where one connects to Heaven (oneness) while present at the level of manifestation (duality). This also speaks to the above discussion of the dai mai and Gall Bladder relating to the return to oneness, moving from duality (legs and arms, earth and humanity) back to unity (the head, upper dantian, and heaven). Note. This table also foreshadows a forthcoming acupuncture article that continues building on this theoretical model by pairing the extraordinary vessels and fu with the primary acupuncture channels and zangfu. One of the most integral aspects of life is the exchange between pre- and post-heaven and vertical and horizontal integration. It is along (and through the transcendence of) these aspects of duality/polarity that the evolution of consciousness may be said to occur. In this paper I have examined the way in which the extraordinary vessels and fu may have a relationship to the evolution of consciousness, as seen through the lens of the ying qi cycle. This cycle shows an intimate relationship between the extraordinary vessels and fu with vertical and horizontal integration, and thus with the process of transformation and the art of humanity. The evolution of consciousness often occurs through these processes of connecting above and below and the inside and the outside—vertical and horizontal integration—which allow for a fuller realization of self on a daily basis. [i] For more information on the concepts of vertical and horizontal integration as discussed throughout this article (as well as their relationship to various aspects of Chinese medicine), see (Richardson 2010a). [ii] “…the qiao mai follow the same pattern as the du mai and ren mai…They are just a development of the du mai and ren mai” (Larre and Rochat de la Vallée 1997, p204). For other perspectives and information on the master-couple pairings, see (Twicken 2006) and (Pirog 1996). [iii] For more information on this interpretation of the functions of the dai mai, see (Richardson 2009b). [iv] Besides the spinal cord and Brain, the long bones of the legs have the greatest concentration of Marrow within the body. If the Marrow and qiao mai have a strong correspondence to the legs, as well as to nourishing the Brain (Sea of Marrow), perhaps they also relate to the connection between the feet and the Brain (macrocosmic Earth and Heaven). It is this connection between the Brain and the legs that allows each individual to walk around at the human level of reality. [v] The qiao mai pertain relatively more to the legs as they are “walker” vessels and their confluent points are on the foot taiyang and foot shaoyin channels, while the wei mai may pertain more to the arms as they are the “linking” vessels, and their confluent points are on the hand shaoyang and hand jueyin channels. It is the hands and arms that allow us to truly connect and link to everything else around us. [vi] It is perhaps for this reason, in part, that the dai mai is also one of the “nuclear” extraordinary vessels. [vii] Fullness in the middle/guan positions can also be associated with other imbalances, depending on the perspective and pulse system used—e.g. this may also relate to middle jiao issues or an imbalance between the Liver and Spleen, or even diaphragmatic involvement. [viii] In the Ode of the Obstructed River are discussed the ‘Eight Therapeutic Methods’ of using the confluent points of the extraordinary meridians to treat specific areas and symptoms. Here Zulinqi GB-41 is indicated for disorders of the eyes, which may offer confirmation of the influence of the dai mai at the level of the upper dantian and head region (as cited in: Deadman 2005). Thomas Richardson, licensed acupuncturist, currently lives and practices acupuncture in Boulder, Colorado. For more information on Extraordinary Chinese Medicine, as well as our acupuncture clinics in Boulder, CO, please visit www.ExtraordinaryChineseMedicine.com. Deadman, Peter and Mazin Al-Khafaji, with Kevin Baker. (2005). A Manual of Acupuncture. (Revised ed). East Sussex: Journal of Chinese Medicine Publications. Larre, Claude and Elisabeth Rochat de la Vallée. (1997). The Eight Extraordinary Meridians. Cambridge: Monkey Press. Transcribed and edited by Sandra Hill. Ming-Dao, Deng. (1990). Scholar Warrior: An Introduction to the Tao in Everyday Life. New York: HarperCollins. (Doctoral Dissertation). Available from Dissertations and Theses database. (UMI No. 3350675). Pirog, John. (1996). The Practical Application of Meridian Style Acupuncture. Berkeley: Pacific View Press. Richardson, Thomas. (2010a). ‘Vertical and Horizontal Integration: The dynamic flow of qi at the level of humanity.’ The Lantern. Forthcoming: Volume 7 (2). Fu.’ Chinese Medicine Times. February 2010. Unfoldment of the Extraordinary Vessels.’ California Journal of Oriental Medicine (CJOM). Volume 20 (2), p. 23-24; 27. Spherical Integration.’ The American Acupuncturist. Volume 48, p.28-31. Twicken, David. (2006). ‘Taoist Cosmology and the Eight Extraordinary Channel Pairings.’ Acupuncture Today. Volume 7 (2). February 2006. Available from: http://www.acupuncturetoday.com/mpacms/at/article.php?id=30314. Yuen, Jeffrey. (2006). The Curious Organs (Qi Heng Zhi Fu): Including Energetics and Pathology, Treatment Protocols, and Selected Characters. 21-22 June 2003. New England School of Acupuncture, Continuing Education Department. Edited by Stephen Howard.